While on vacation this past May, Go Here. My daughter and I rented a car and took a drive to wonderful beach located on Oahu's windward coast. You can see why they call it the Windward Coast. Kailua Beach is about 30 minutes from Honolulu and Waikiki where we were staying. Windsurfing is very popular in Oahu, and Kailua Beach is known for its steady trade wind breezes, and offers the perfect conditions for Windsurfing and Kitesurfing. Two girls, two floaties and the most beautiful white sandy beach! Windsurfing combines elements of both surfing and sailing. and the consistent winds provides the perfect location for Windsurfing. Always a sand castle in the making. 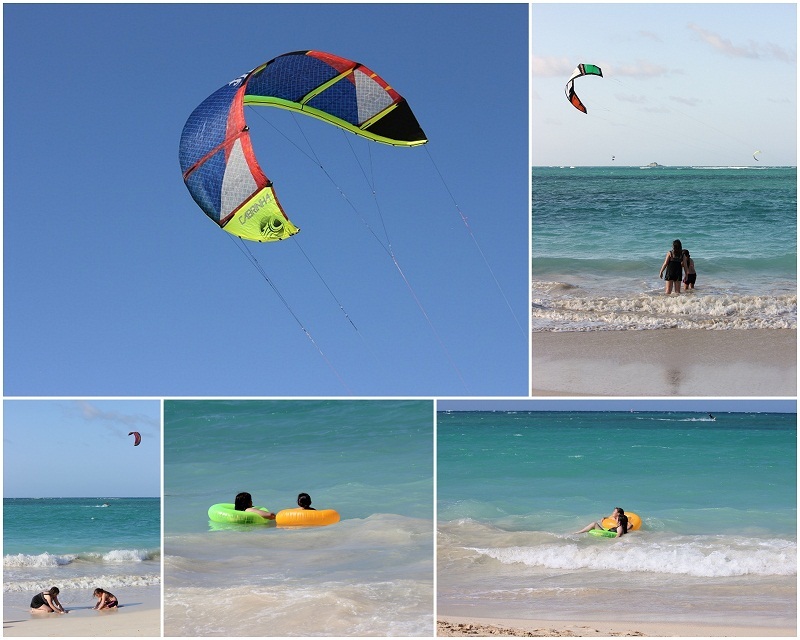 Kailua is a must visit for Kitesurfing/Kiteboarding. The beach has the best all around conditions for this sport any where in Hawaii. There is a beautiful grass area to stage the kites and a sandy beach for the launch. It's late afternoon and I watched the kitesurfers set up for their launch. I think they play after work. I would! Reminds me of water skiing without a boat. The girls were very impressed too! sharing some fabulous quality time together. Beautiful photos, I love Hawaii. Life is GOOD! Have a wonderful day! What great photos showing the water activities! Hawaii is on my bucket list...not sure I will get there! So, I will just enjoy it vicariously through other's photos! Beautiful colors against the backdrop of sky. Looks like you had a lot of fun there. Thanks for sharing! Beautiful! Looks like you had loads of fun! I am hoping to go to Sheboygan this weekend. Would you believe that we have windsurfer, kite surfers, ect in Wisconsin!! I haven't seen them yet. But it looks so interesting! Now for the weather to cooperate. Oh, I am SO jealous, Betty! I love the beach, no matter where it is! Hawaii sounds awesome! I've never tried either wind or kite surfing, but it doesn't look very easy. I found your blog over at "Home and Garden Thursday" blog hop and am following you now. Check out my fairly new blog,if you get the chance. I think we have many similar interests that we both post about. Wow, beautiful images Betty. The beach is always so much fun. Hey there! I just stumbled on your cute blog and I have to say I’m your newest adoring follower! Also I’d just love for you to come check out a giveaway I’m having that ends tomorrow!! Hope to see you there! What fun y'all are having! Oh, my! What fun you must be having. Wonderful photos. All that beautiful blue water and skies! Toss in a few sandcastles and you have perfection!